When homeowners Rosemary and Lowell Peterson first saw the house in which they now happily make their home, they were…underwhelmed. Though the home was right where they wanted to be with gorgeous West Grand Traverse Bay views and even a mooring spot for their sailboat, they weren’t sure the house was right for them. It was closed off and dark, with low ceilings and outdated everything. 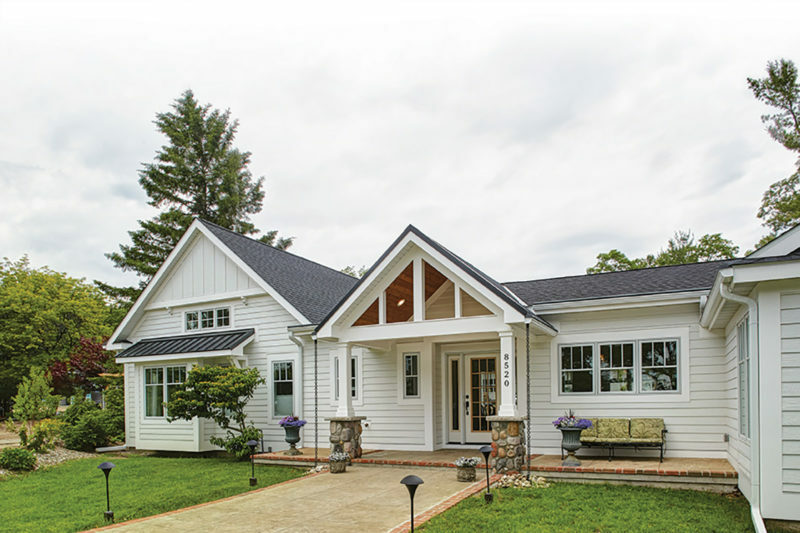 They met with some builders, but no one really understood their vision until Jeff Simonis of Simonis Custom Home Building and Remodeling came along. “Not every builder is as enthusiastic as Jeff is,” say the homeowners. “Jeff said, ‘I can work with this.’” Together, they began a journey that would transform the lackluster dud into the home of their dreams. Rosemary is an artist, so she had a lot of ideas about what she wanted. Her vision: windows everywhere, very airy, a more interesting roofline, and a cottage look. Simonis is also an artist, so he was able to take her vision and run with it. They even describe it artistically: “The house was orchestrated, and Simonis was the conductor,” says Lowell. They started by knocking almost everything down, one section at a time. The rebuilt 3,000-square-foot home won multiple awards from the Home Builders Association (HBA) Parade of Homes, including Best Overall Remodel. Outside, they chose white SmartSide lap siding with a varied facade that keeps the look dynamic and interesting. The roof is black metal with three gables, including a darling covered porch. While the 42 windows make for a light and airy feel, the use of closed-cell foam insulation ensures that the busy street noise stays outside. To keep the look going inside, the ceilings were opened up to take advantage of the nine-foot walls, and scissor trusses were added to make soaring cathedral ceilings. The walls inside the main living area stayed white; Rosemary calls it her blank slate that she can cover with paintings and other art. The floors throughout the main level are finished with stunning hand-scraped elm, from the three bedrooms and three baths through to the great room. There are unexpected surprises around every corner…like the closet converted to a wet bar that has a backsplash made of gorgeous hand-painted tile and the small fireplace built into the wall of the family room. The house also won “Best Kitchen” from the HBA, and it’s easy to see why. The sprawling 55 x 100-inch island anchors the room and is topped in a Copenhagen granite with quartz running through it. There is a stovetop with a pop-up downdraft, so no need for a big exhaust fan overhead. Instead, you see a pair of amazing, oversized light fixtures. One of the Petersons’ favorite spots in the kitchen is the breakfast bar that overlooks the front yard and West Bay, perfect for enjoying their morning coffee. French doors lead to the patio, which is a beautiful gathering space. “I’ve always loved to cook and bake,” says Rosemary, “I’ve never had a fancy kitchen. Now I have a kitchen that is exactly what I’ve always wanted.” The dining space flows from the kitchen and features an Italian chandelier lighting a French dining table the couple had made when they lived overseas. It’s a truly international dining experience. It wasn’t always easy going; the biggest challenge was to keep the existing footprint of the house. “It’s what’s on the inside that really matters to me,” says Simonis, “the structural part. Some builders cover it up. I fix it and do it right the first time.” Rosemary concurs, “Jeff is a perfectionist, an ethical builder.” The Simonis team essentially fixed and used the existing foundation and built a new home on top of it. The one room they left up was the great room. It has a brick wall with a giant fireplace, above which sit Rosemary’s father’s Elizabethan wood carvings, making a spectacular display. The master bedroom continues the open, inviting feel, and the master bath has a large walk-in shower with sedate gray porcelain tile. Simonis and his team repurposed leaded glass windows from the original home and made custom bedroom doors. Details such as heated towel racks enhance the feel of luxury. The second bathroom has a soaking tub and river rock flooring that looks like smooth pebbles underfoot. Simonis allowed six weeks to do all of the tile in the home himself; it’s the perfectionist in him, he says. The biggest architectural challenge was turning the spiral staircase leading to the lower level into a stairway that meets code, is functional, and is as beautiful as the rest of the home. They also dry-locked the lower level’s walls, sealed the floors, and added a closet and windows so guests have a beautiful suite when they visit. The most impressive factor of this project is truly in the transformation. To see the before and after pictures is to see a true mix of old and new. The way Simonis blended the past into present seamlessly makes for a breathtaking space that is a pleasure for the Petersons to call home.